77 May DOYLE: THE TRAGEDY OF THE KOROSKO (Sidney Paget). Issues 77-84. 78 June DOYLE: THE TRAGEDY OF THE KOROSKO (Sidney Paget). Issues 77-84. 79 July DOYLE: THE TRAGEDY OF THE KOROSKO (Sidney Paget). Issues 77-84. 80 Aug DOYLE: THE TRAGEDY OF THE KOROSKO (Sidney Paget). Issues 77-84. 81 Sept DOYLE: THE TRAGEDY OF THE KOROSKO (Sidney Paget). Issues 77-84. 82 Oct DOYLE: THE TRAGEDY OF THE KOROSKO (Sidney Paget). Issues 77-84. 83 Nov DOYLE: THE TRAGEDY OF THE KOROSKO (Sidney Paget). Issues 77-84. 84 Dec DOYLE: THE TRAGEDY OF THE KOROSKO (Sidney Paget). Issues 77-84. WHITECHURCH, Victor L.: AN HONOURABLE RETREAT: AN INCIDENT OF THE FRENCH RAILWAY (Claude A. Shepperson). 106 Oct DOYLE: THE CROXLEY MASTER (Sidney Paget). Issues 106-108. 107 Nov DOYLE: THE CROXLEY MASTER (Sidney Paget). Issues 106-108. 108 Dec DOYLE: THE CROXLEY MASTER (Sidney Paget). Issues 106-108. 119 Nov WELLS, H. G.: THE FIRST MEN IN THE MOON (Claude A. Shepperson). Issues 119-128. 120 Dec WELLS: THE FIRST MEN IN THE MOON (Claude A. Shepperson), Issues 119-128. 121 Jan WELLS: THE FIRST MEN IN THE MOON (Claude A. Shepperson). Issues 119-128. 122 Feb WELLS: THE FIRST MEN IN THE MOON (Claude A. Shepperson), Issues 119-128. WELLS: THE FIRST MEN IN THE MOON (Claude A. Shepperson). Issues 119-128. CARROLL, Lewis: A VISIT TO TENNYSON*, A letter. First publication. WELLS: THE FIRST MEN IN THE MOON (Claude A. Shepperson), Issues 119-128. 127 Jul WELLS: THE FIRST MEN IN THE MOON (Claude A. Shepperson), Issues 119-128. 128 Aug DOYLE: THE HOUND OF THE BASKERVILLES (Sidney Paget). Issues 128-136. WELLS: THE FIRST MEN IN THE MOON (Claude A.Shepperson). Issues 119-128. 129 Sept DOYLE: THE HOUND OF THE BASKERVILLES (Sidney Paget). Issues 128-136. 130 Oct DOYLE: THE HOUND OF THE BASKERVILLES (Sidney Paget). Issues 128-136. 131 Nov DOYLE: THE HOUND OF THE BASKERVILLES (Sidney Paget). Issues 128-136. 132 Dec DOYLE: THE HOUND OF THE BASKERVILLES (Sidney Paget). Issues 128-136. 133 Jan DOYLE: THE HOUND OF THE BASKERVILLES (Sidney Paget). Issues 128-136. 134 Feb DOYLE: THE HOUND OF THE BASKERVILLES (Sidney Paget). Issues 128-136. 135 Mar DOYLE: THE HOUND OF THE BASKERVILLES (Sidney Paget). Issues 128-136. 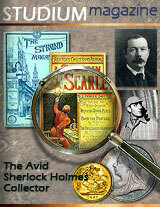 136 Apr DOYLE: THE HOUND OF THE BASKERVILLES (Sidney Paget). Issues 128-136.